McLain Ward and Clinta. Photo © Sportfot. The 2018 WEG team gold medal-winning duo of McLain Ward (USA) and Clinta outpaced a field of 68 entries to take victory in the $36,000 Equinimity WEF Challenge Cup Round 8 CSIO4*. With the featured Thursday event held as a one round speed class, the time to beat when Ward entered the ring had been set at 74.63 seconds by Switzerland’s Martin Fuchs and his mount, Silver Shine, owned by Willow Grace Farm. Laura Chapot (USA) and Out of Ireland topped a field of 92 entries to win the $25,000 ProElite® 1.45m Jumper Classic on Thursday in the International Arena. The large starting field was narrowed down to 11 entries qualified to return to jump off over the Steve Stephens-designed course, and once onto the jump-off, the early time to beat – and the first double clear effort – was turned in by the sixth to return, Kelli Cruciotti (USA), who tripped the timers in 30.76 seconds to move into the lead aboard Grandy de Laubry, owned by 3 Seas, LLC. Cruciotti’s lead would prove to be short-lived however, as Chapot returned next, stopping the clock in 28.81 seconds to ultimately take the win aboard Out of Ireland, owned by The Edge. More than 40 horse-and-rider combinations competed against each other for the champion and reserve champion ribbons in the FarmVet Performance Hunter 3’3” division during Week 8 of the 2019 Winter Equestrian Festival. Held in the E. R. Mische Grand Hunter Field at the Palm Beach International Equestrian Center on Thursday, Christopher Payne of Cincinnati, OH was awarded the division’s champion ribbon. Payne was aboard Susan Moriconi’s six-year-old Holsteiner gelding Holden On, (Casall x No Lady) a horse that is fairly new to the Performance Hunter division. Despite a lack of experience, the gelding racked up two firsts, two seconds, and one fifth to catapult to the top of the leaderboard in the competitive division. Christopher Payne – Winner of the $10,000 Hallway Feeds Leading Professional Rider Award. Photo By: Shawn McMillan. Lexington, KY – October 13, 2014 – After winning this year’s first Hallway Feeds USHJA National Hunter Derby at the Kentucky Spring Horse Show, Christopher Payne took over the top of the Leading Rider standings and never relinquished it. The talented professional of New Hope LLC went on to capture multiple top placings throughout the spring and summer. At the end of the Hallway Feeds USHJA National Hunter Derby Series, Payne accumulated 1375 points to take home the coveted $10,000 Hallway Feeds Leading Professional Rider Award. The Hallway Feeds Series consists of seven national hunter derby events held throughout the 2014 show series at the Kentucky Horse Park. During the final event at the Kentucky National Horse Show, Payne’s achievements throughout the year were recognized with the $10,000 Hallway Feeds Leading Professional Rider Award, which went to the professional rider accumulating the most points in the seven classes that make up the series. Payne also received a free flight for a horse, in the continental US, provided by Tex Sutton. In addition to the $10,000 Hallway Feeds Professional Rider Award, there were also awards for the amateur rider and junior rider accumulating the most points. Vivian Yowan scored the $2,500 Hallway Feeds Junior Rider Award after earning multiple top ribbons throughout the spring and summer. There was a tie between Adele Norton & Didi Mackenzie, and they shared the $2,500 Hallway Feeds Amateur Rider Award. The Hallway Feeds USHJA National Hunter Derby Series would not be possible without many generous sponsors including Hagyard Equine Medical Institute, Alfagreen Supreme, Sweet PDZ Horse Stall Refresher, Caddel Equine Therapy Center, Trouw Nutrition, EquiVision, Sallee Horse Transport, Tack Shop of Lexington, Tex Sutton, Turf Town Properties and PNC Bank. For more information about Kentucky Horse Shows, LLC, please visit www.kentuckyhorseshows.com. Lexington, KY – August 20, 2014 – The fifth event in the 2014 Hallway Feeds USHJA National Hunter Derby Series was held last Sunday at the Kentucky Horse Park during the Bluegrass Festival Horse Show. Coming back from two second place finishes during the first two weeks of the Kentucky Summer Series, Christopher Payne took home the winning honors with Harlan during the highlight event, increasing his lead in the Hallway Feeds Leading Rider standings. The Hallway Feeds Series consists of seven national hunter derby events to be held during the 2014 show series at the Kentucky Horse Park. Following the final event, cash prizes totaling $15,000 will be awarded to the series’ leading riders. Molly Sewell has jumped ahead of the winner from the Kentucky Summer Classic, Steve Heinecke, taking over the second place position after placing second on Sunday. Heinecke now sits in the third place position. Vivian Yowan leads the Junior standings, while Adele Norton leads the Amateur standings. The USHJA National Hunter Derby program is in its fifth year and is growing in prestige and popularity. Amateurs, juniors and professional riders are eligible to compete, giving it a broad base of support and interest. The $15,000 Hallway Feeds Leading Rider Awards will present a $10,000 cash prize to the professional rider accumulating the most points in the seven classes that make up the Series. The amateur rider and junior rider accumulating the most points will each receive a $2,500 cash prize. Riders will receive points only on their highest placed horse in each of the classes. The awards will be presented at the conclusion of the Hallway Feeds class at the Kentucky National Horse Show on September 20, 2014. Kentucky Summer Horse Shows, USEF National Pony Finals, Bluegrass Festival Horse Show and KHJA Horse Show, and the 2014 USHJA International Hunter Derby Finals. The Kentucky Horse Show LLC’s 2014 series includes five weeks of top competition throughout the summer. These premier hunter/jumper competitions host the Hagyard Challenge Series with seven grand prix competitions that culminate with a Leading Rider Award, as well as the Hallway Feeds National Derby Series. Reservations may not be made through the Horse Show office. To reserve a campsite at the Kentucky Horse Park for any of the horse shows, please call the Campground store at (800) 370-6416 or 859-259-4157 or email Sherry Logan at sherryd.logan@ky.gov. Be specific as to the show name and the dates you wish to stay. Check-in time is 2:00 p.m. and check-out is 12:00 noon. You must make arrangements with the Campground store if you plan to arrive earlier than 2:00 p.m. or stay later than 12:00 noon. Vehicles that are not removed from a campsite by check-out time will be towed. Christopher Payne and Harlan claim victory in the National Hunter Derby. 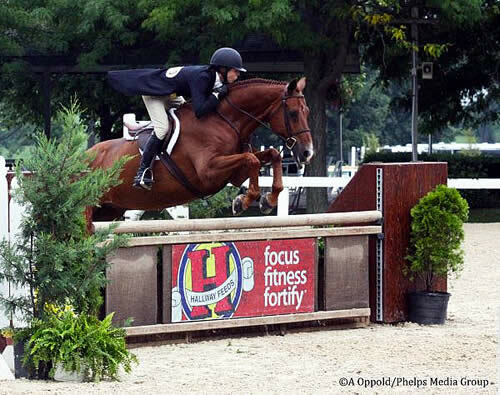 Lexington, KY – August 17, 2014 – Despite a consistent drizzle for most of Sunday afternoon, the $5,000 Hallway Feeds USHJA National Hunter Derby displayed 46 horse and rider pairs, with Christopher Payne and Harlan claiming the blue ribbon. Molly Sewell aboard El Raymond took second place. While observers and waiting mounts stood under trees and other cover, rider and horses tried to navigate the course with ease and fluidity. Payne said he liked today’s course, which featured an interesting set-up and a Hallway Feed jump as the Derby’s sponsor. “It was an interesting course because all the jumps were kind of in the middle of the ring; there weren’t any outside lines so it was a lot of curves and turns, which seemed to work well for me,” said Payne. Even with the constant pattering of rain, Payne said the footing held up incredibly well. “It can pour down rain in here and everyone can still get out there and do it,” he said. Payne certainly did it today, putting in solid rounds on both Harlan, the 10-year-old Belgian Warmblood gelding owned by Susan Moriconi, and Holden, a 12-year-old Holsteiner gelding also owned by Moriconi. Both mounts qualified for the handy round and showed off their soft turns and maneuvered a trot fence. Harlan came out on top and Holden gained a respectable 6th. Payne said Harlan, who is also shown by his owner in the Over 50 Adult classes, is a very fun horse to ride. Harlan was definitely on his game today garnering the lead in the classic round and an impressively high score of 94 in the handy round, making Payne and Harlan the clear winners. Payne was excited about the victory and is looking forward to getting on the road for his next competition, the Hampton Classic Horse Show. Before the Bluegrass Festival Horse Show, Payne was ranked fourth in the rider standings for the National Hunter Derby. With today’s resounding victory his star is sure to rise. Payne was also very grateful to Hallway Feeds for sponsoring the event. “It’s a really great thing that they sponsor a hunter derby like this. It really means a lot because we need that support in the hunters. I really appreciate it,” said Payne. Coming in second was Molly Sewell aboard El Raymond, a 16-year-old Warmblood gelding owned by Leslie and Stuart Campbell. Sewell’s solid handy round received a score of 90 and placed them right behind Payne and Harlan. Coming in third was Brianna Davis on Hip Hop, a 10-year-old Holsteiner gelding owned by Erik Johnson. To learn more about the Kentucky Summer Horse Shows, visit www.kentuckyhorseshows.com. 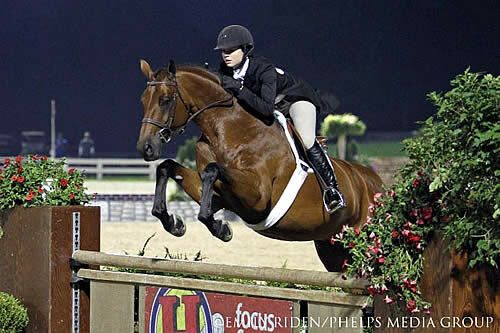 Lexington, KY – August 5, 2014 – The Kentucky Horse Park hosted the Kentucky Summer Classic last week, as well as the fourth event in the 2014 Hallway Feeds USHJA National Hunter Derby Series. For the second week in a row, Christopher Payne took home the second place award, this time aboard Channing. Coupled with two wins in the spring, Payne has furthered his lead in the Hallway Feeds Leading Rider standings. The Hallway Feeds Series consists of seven national hunter derby events to be held during the 2014 show series at the Kentucky Horse Park. Following the final event, cash prizes totaling $15,000 will be awarded to the series’ leading riders. Last week’s winner, Steve Heinecke, placed third the previous week and climbed into the second place position. Molly Sewell’s fourth place ribbon during the Kentucky Summer Classic and victory during the Kentucky Summer Horse Show put her in a close race for third. Vivian Yowan leads the Junior standings, while Adele Norton leads the Amateur standings. For more information about the Kentucky Summer Series, please visit www.kentuckyhorseshows.com. Lexington, KY – May 17, 2014 – Christopher Payne and Harlan were the first to go in today’s $5,000 Hallway Feeds USHJA National Hunter Derby, and they laid down a score of 92 to set a standard that would not be beat. Their score held up as the highest in the opening round of the derby at the Kentucky Spring Classic and put them on track to eventually clinch the victory. The win today at the Kentucky Horse Park puts Payne two for two in the 2014 Hallway Feeds USHJA National Hunter Derby Series at the Kentucky Horse Shows. He won the kick-off class in the series last week aboard Churchill, and his win tonight with Harlan gives him a commanding lead in the series’ point standings. Cash prizes totaling $15,000 will be awarded to the Series’ leading riders following the final event in the seven-part series. Today’s class saw 28 competitors show over the Bobby Murphy designed course in the Stonelea Ring. Of the 28 horse and rider combinations competing in the opening round, the top 12 scoring pairs advanced to the handy round. In addition to returning in the lead with Harlan, Payne and Churchill sat tied for the second place spot with Megan Clark and Dreamwork on a score of 88. Close behind them were Vivian Yowan and Saddle Ridge LLC’s Gretzky with a score of 87. Rounding out the top five in another tie were Kelli Cruciotti riding Verbatim and Adrienne Iverson aboard Cenerife, each with a score of 86.5. Iverson and Cenerife, owned by Eight Oaks, were the first of the top contenders to return, earning a second round score of 89 and putting them into an early lead with a combined score of 175.5. That lead was soon overtaken by Payne and Churchill, owned by Susan Moriconi, as the pair jumped to the top of the leader board with a second round score of 89.5 for an overall 177.5. As the remaining top combinations returned the lead changed hands two more times, going next to Cruciotti and her own Verbatim with a final total score of 178.5. Next in the ring, Yowan and Gretzky did not overtake the lead, but they did move up the list, climbing from fourth to the eventual third place finish. Meanwhile, an unfortunate rail moved Clark and Dreamwork from the second place out of the top 10. With Cruciotti in the lead, it came down to the last to return – Payne and Susan Moriconi’s Harlan. The pair cantered right from the gate to fence one, a vertical at the far end of the ring and continued to deliver a seamless trip from there, earning them a score of 88.5 and guaranteeing them the victory. With Harlan and Payne in first, the second place honor went to Cruciotti and Verbatim, a horse she and her mom just purchased from Larry Glefke and Kelley Farmer at the end of the winter season in Florida. Both Payne and Cruciotti look forward to competing throughout the rest of the Hallway Feeds Series. The Kentucky Spring Classic comes to a close tomorrow, but hunter jumper competition at the Kentucky Horse Park continues this summer with the Kentucky Summer Horse Shows, kicking off on July 23, 2014. To learn more about the Kentucky Spring Horse Show, please visit www.kentuckyhorseshows.com. Christopher Payne Leads the 2014 Hallway Feeds USHJA National Hunter Derby Series. Photo By: Emily Riden/PMG. Lexington, KY – May 13, 2014 – The Kentucky Spring Horse Shows began on Wednesday, May 7, 2014, and one of the highlight events was the kick-off of the 2014 Hallway Feeds USHJA National Hunter Derby Series. The Hallway Feeds Series consists of seven national hunter derby events to be held during the 2014 show series at the Kentucky Horse Park. Following the final event, cash prizes totaling $15,000 will be awarded to the series’ leading riders. The Kentucky Spring Horse Show featured the lead-off event on Saturday evening with the $5,000 Hallway Feeds USHJA National Hunter Derby. The top riders from across the nation gathered to compete over a challenging course and vie for the winning title and valuable points toward the $15,000 Leading Rider Awards. At the end of the night it was Christopher Payne and Churchill who led the victory gallop, giving Payne the lead in the standings. Hayley Barnhill, who placed second with Walker, and Adrienne Iverson, who picked up the third place award with Cenerife, follow Payne closely in the rankings. The Kentucky Spring Classic, May 14-18, 2014, will host the second event in the series on Saturday, May 17, in the Stonelea Arena. For more information about the Kentucky Spring Horse Shows, please go to www.kentuckyhorseshows.com. 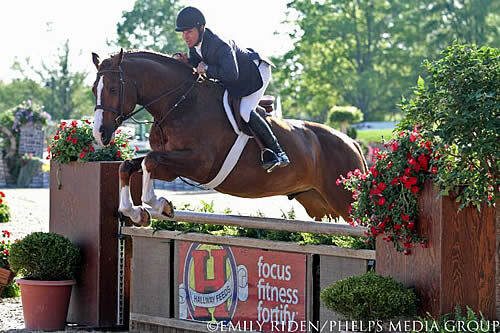 Lexington, KY – May 10, 2014 – When Larry Glefke and Kensel LLC purchased Mindful just a few weeks ago they did so with one intention – providing a top hunter derby contender for Kelley Farmer. Mindful proved tonight that he definitely fits that bill, as he and Farmer earned the victory in the $15,000 USHJA International Hunter Derby at the Kentucky Spring Horse Show. Finishing in second place in the Rolex Stadium at the Kentucky Horse Park were Hayley Barnhill and John and Stephanie Ingram’s Airport 48; third place went to So To Speak, another talented Larry Glefke and Kensel LLC owned entry ridden by Farmer. Six-year-old So To Speak also proved to be a strong contender, leading at the end of the first round with scores from the two judging panels of 84 and 90. Those scores coupled with the bonus points awarded for Farmer’s decision to take all four high option fences gave the pair a combined first round total of 182. Mindful advanced to the second handy round just behind So To Speak with a combined score of 180. Rounding out the top three after the opening round over the Bobby Murphy designed course were Barnhill and Airport 48. Entries returned in reverse order of their standings for the handy round, but, as Farmer was juggling three entries in the second round, she and Mindful moved up in the order and were the first of the top three to return. From the opening vertical to the final high option fence, Farmer and Mindful laid down a seamless trip, and the judges agreed. The two judging panels awarded them base scores of 89 and 88; with handy bonus and high option points added they would finish on a second round total of 199 and a 379 grand total, shooting them straight to the lead. Barnhill and Airport 48 looked like they were going to give Farmer and Mindful a real run for their money, but judges’ scores of 88.5 and 80 left them short of the lead with a second round total of 189.5 and a final score of 363.5. While it would not give them the win, it would hold up for second place. Before Barnhill and Airport 48 took officially claim the second place honor, Farmer had to turn in her final ride of the night aboard So To Speak. The second place award or even the victory seemed to be very much in reach for the pair, but an unfortunate lead swap before the final fence would relegate them to the third place position. “He’s only 6 years old. He’s got a big future,” owner and trainer Glefke said of So To Speak. Farmer is equally excited about Mindful, a 10-year-old Hanoverian gelding purchased from Callie Schott less than three weeks ago. She has her sights set on this year’s USHJA International Hunter Derby Finals with the new gelding, but until tonight, she had no idea how he would even perform in a hunter derby format. Doing well with Mindful at this year’s Derby Finals is a big target on Farmer’s radar this year, so Farmer was appreciative of the opportunity to not only see how Mindful would perform in a hunter derby, but in a hunter derby in the same venue and setting as the Derby Finals. “It’s the only time we get to get in the ring before Derby Finals, and it’s the same time of night when you have all of the shadows, and it’s really dark,” Farmer said. With a win in the Rolex Stadium under her belt, Farmer can continue to look toward the USHJA International Hunter Derby Finals, which will be held at the Kentucky Horse Park in August during the Bluegrass Festival Horse Show. The night kicked off with the $5,000 Hallway Feeds USHJA National Hunter Derby, the first of seven events culminating with the $15,000 Leading Rider Bonuses. Chris Payne earned the early lead in the year-end standings by leading the first event from start to finish aboard Susan Moriconi’s Churchill. A smooth opening round resulted in a score of 89, and as the last to return for the handy round the pair expertly handled the inside turns and high options to earn a 94 for a 183 total. Bobby Murphy built a 10 obstacle course for the first round of tonight’s event set at 3′ with four 3’6″ option fences. There was a two-stride line as well as bending lines and multiple rollbacks. The fences were decorated to imitate natural obstacles a rider would experience when hunting. The top 12 scoring horse and rider combinations were invited to return for the handy round, which also had four options as well as a trot fence and multiple inside turns to showcase handiness. Hayley Barnhill was ranked fifth going into the handy round after earning a score of 84 aboard Walker, owned by Danielle Leach. They picked up a smooth canter and were able to execute an excellent trot fence, as well as taking the inside and high options. The judges awarded their efforts with a score of 87 for a 171 total. Adrienne Iverson returned next riding Cenerife for Eight Oaks, having received a score of 85 in the first round. The pair also had an excellent round, galloping easily to the final oxer and jumping easily over the high options. The judges announced a score 86, creating a tie of 171 with Barnhill. In the end, Barnhill’s handy round score would earn her the second place honors, while Iverson settled for third place. With two good scores already on the leader board, the pressure was on Payne to produce another flawless round with Churchill. The handy was a breeze for the brave horse though; who navigated the inside turns smoothly and accurately. The judges turned in score of 94, for a 183, total making Payne and Churchill the clear winners. “Churchill is so peaceful and so solid minded that he doesn’t get flustered about anything,” smiled Payne. “He tries to do whatever he asks you to do, and he has this beautiful big, rangy, lopey step. It’s just really enjoyable to ride. Payne added, “We thought maybe showing tonight would help in the First Years because he takes everything so easily. We thought the bigger jump would help him in the First Years. He was good in the First Years so thought maybe he could be a Derby contender. Tomorrow’s hunter events will include championship and reserve championship awards in the Junior Hunter and Children’s Hunter divisions. Next week, riders will return to the Kentucky Horse Park for the Kentucky Spring Classic, with the second $5,000 Hallway Feeds National Hunter Derby scheduled for Saturday evening. Lexington, KY – May 8, 2014 – Maypine Farm’s Truman has bundles of talent and, as of today, a Kentucky Spring Horse Show championship tricolor to his name. This morning, Christopher Payne rode the 7-year-old gelding to the First Year Green Hunter championship title at the Kentucky Horse Park. Truman and Payne came in to the day with a first and third place finish over fences under their belts, sitting neck-and-neck in the points race with Kelley Farmer and So To Speak, who had finished yesterday with a first and second place ribbons. Truman and Payne clinched the championship and relegated Farmer and So To Speak to the reserve championship by finishing second in the handy class and earning the win in the under saddle. Taking the time to bring Truman cautiously up the ranks is something that Payne says is extremely important in bringing him along, and it has already paid of tenfold – Truman was Reserve Circuit Champion at this year’s Winter Equestrian Festival. Payne and the team at New Hope Farm, LLC are working to do right by a number of horses at this week’s Kentucky Spring Horse Show; they have brought approximately 25 horses to compete throughout the week at the Kentucky Horse Park. Farmer and Lane Change Farm have also brought a full, competitive contingent to the Kentucky Spring Horse Shows, and they will be returning to their newly acquired home base in Lexington with a full string of tricolors. After claiming the reserve championship in the First Year Green Hunters, Farmer earned the Green Conformation Hunter championship aboard Scripted, the Regular Conformation Hunter reserve championship aboard Quotable and the Regular Conformation Hunter championship on Mindful. Larry Glefke and Kensel, LLC own all three horses, and Mindful is the most recent addition, having just joined the team less than two weeks ago. Hunter competition at the Kentucky Spring Horse Show continues tomorrow with the Amateur-Owner Hunter divisions beginning at 8 a.m. In addition to offering a full range of competitive hunter divisions, this week’s hunter highlight classes include the $5,000 Hallway Feeds USHJA National Hunter Derby and the $15,000 USHJA International Hunter Derby on Saturday night in the Rolex Stadium.